Following the tragic February 14 shooting at Marjory Stoneman Douglas High School in South Florida, Monster Energy Fort Rock festival producers Danny Wimmer Presents and AEG Presents–along with Corey Taylor, Halestorm and various other music artists performing at theApril 28 & 29 festival at Markham Park in Sunrise, FL–are showing their support for the students and advocating for school safety. Those who would like to utilize the 50% off ticket promotion simply need to send a screenshot of their signed petition or forward their confirmation email to dh@dwpresents.com. The promotion is available through April 1, 2018, while supplies last. 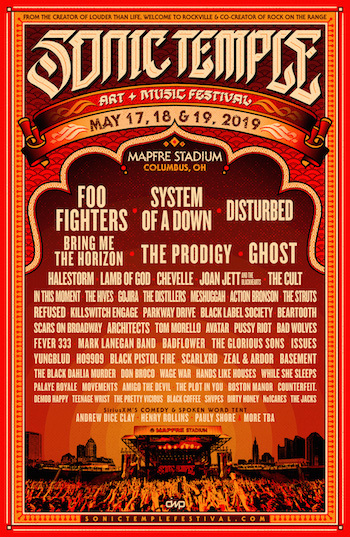 The 6th annual Monster Energy Fort Rock–South Florida’s Biggest Rock Experience–features rock’s top artists performing on two stages, including: Ozzy Osbourne, Godsmack, Five Finger Death Punch, Stone Sour, Shinedown, Breaking Benjamin, Stone Temple Pilots, Halestorm and many more.